Pakistani ex-President Pervez Musharraf has been charged in connection with the 2007 assassination of opposition leader and former PM Benazir Bhutto. The former military ruler has denied charges of murder, criminal conspiracy to murder and facilitation of murder. It is the first time a current or ex-army chief has been charged with a crime in Pakistan. Mr Musharraf says the charges are politically motivated. Ms Bhutto was killed at an election rally in Rawalpindi in December 2007. This indictment had long been expected but was delayed because of threats to the former military ruler from the Pakistani Taliban. When he finally made an appearance in the anti-terrorism court in Rawalpindi it was amid tight security. Media captionPervez Musharraf's lawyer Afsha Adil: "There is no evidence on record...These are all fabricated cases"
Six others were charged along with Mr Musharraf, including four suspected militants and two senior police officials. The court set the next hearing for 27 August. Mr Musharraf's legal team say the evidence against him is fabricated and dismissed the indictment: "These charges are baseless. We are not afraid of the proceedings. We will follow legal procedures in the court," his lawyer, Syeda Afshan Adil, told the Agence France-Presse news agency. The court that indicted Pervez Musharraf has made history. In a country where the military has controlled political power directly or indirectly for most of its 66-year history, no civil court has ever charged a service head with a political crime. The charges against him carry a maximum punishment of death. So what lies behind these developments? A UN inquiry requested by the former Pakistan People's Party (PPP) government clearly raised questions over his government's role in the Benazir Bhutto murder. But the PPP had little interest in pursuing that case, probably as it too was being hounded by the military and judiciary - and Mr Musharraf was in exile anyway. Even after he returned earlier this year, the interim government didn't want to drag him through the courts, so the judiciary took the lead. The case is now taking its due legal course, and we can safely say that it was the judiciary that actually went after him. The motive may be revenge, according to some, because of Mr Musharraf's attempts to sack the entire higher judiciary in 2007. Or it could simply be an opportunity to break new ground in Pakistan's legal history by arraigning a former army chief. The former military ruler returned to Pakistan from self-imposed exile earlier this year and is currently under house arrest. He came to power in 1999 when he ousted Prime Minister Nawaz Sharif in a bloodless coup. He ruled the country for nine years before being voted out and then he left Pakistan to live in self-imposed exile in Dubai and London. Upon his return he hoped that he could lead his party into elections, but was disqualified from standing and found himself fighting an array of charges relating to his time in power. These include cases relating to the murder of a Baloch tribal leader, Nawab Akbar Bugti, in 2006 and his attempt to sack the entire higher judiciary in November 2007. Mr Sharif is now back in power, having emphatically won elections earlier this year. 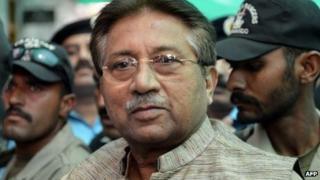 His government has said that it also plans to put Mr Musharraf on trial for treason. Ms Bhutto's assassination at an election rally in Rawalpindi on 27 December 2007 was blamed by Mr Musharraf's government on the Taliban. A 2010 UN report said Benazir Bhutto's death could have been prevented and that Mr Musharraf's government failed to provide enough protection - at the time his aides dismissed the report as a "pack of lies". Ms Bhutto was the daughter of former Prime Minister Zulfikar Ali Bhutto, who was himself executed in 1977 after being ousted in a coup. She was imprisoned shortly after that coup but went on to be twice elected prime minister. In 2007 she came back to Pakistan after years abroad under a deal in which Mr Musharraf allowed her to return to take part in elections to be held in 2008. But her assassination in a gun and bomb attack during the rally in Rawalpindi sparked massive protests and her Pakistan People's Party won a resounding victory in the polls allowing her widower, Asif Ali Zardari, to take up the presidency.